The Western Otway Region Awards were held at the Warrnambool Racing Club last Thursday, where the McLean team featured quite prominently. Maythehorsebemagic was awarded Jumping Horse of the year, winning 4 of his 7 starts over the jumps. His major achievements were the JJ Houlahan Hurdle and the Australian Steeplechase. He also had a stellar season on his home track winning 2 of his 3 jumps starts, including a win at the Carnival. Whilst Magic was winning all of these races, he couldn’t have done it without the superb rides of Brad McLean. Brad was awarded the Ted Byrne Medal, which is judged by the stewards, with an impressive winning strike rate of 29.72%. 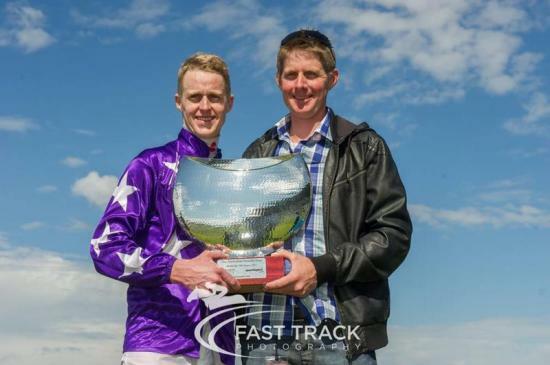 To cap off a fantastic jumps year, Jarrod was awarded Western Otway Leading Jumps Trainer. We’ve had a brilliant year with a lot of nervous and exciting moments throughout. The most excitement was probably when Cats Fun won the Brierly Steeplechase during the carnival. It was the best cheer squad we’ve had at the races in a long time. Jarrod also finished 3rd behind Ciaron Maher and Robert Smerdon in the Victorian Jumps Premiership with an outstanding winning strike rate of 33.33%. We look forward to another exciting jumps season next year.